ROYALE® Tiger Towel® paper towel is Tiger Strong™ even when wet – which makes them great for any kind of DIY wipe you may need around your home. Keep these easy, homemade natural wipes by the changing table, or in the kitchen to clean up sticky hands and faces in an instant. Cut your roll of Tiger Towel® in half. Pour water into a microwave-safe bowl. Pour the liquid mixture over the roll. Seal and shake to soak the paper towel. Remove the core once soft enough. Stash nearby so wipes are handy when needed. From heavy-duty Halloween makeup to a big night out, makeup removal is a habit we’d all like to fast-forward through. Make it easier with these pre-made non-toxic wipes*. *Please use caution if you have sensitive skin or allergies. Place the folded Tiger Towel® in the container. In a small bowl, mix the coconut oil, liquid castile soap and water together. Pour the mixture over the Tiger Towel® and press down slightly to help the coconut oil and soap absorb into the paper towel. Place the lid on the container and shake everything up. This will help to distribute the liquid equally. Tiger Towel® paper towel combined with these natural ingredients is gentle on your skin yet strong enough to remove even long-lasting makeup. Use one sheet at a time (one will go a long way.) Throw away the wipe after use. Make sure to keep the lid on the container to prevent the wipes from drying out. These chemical-free DIY wipes will keep your mat fresh and will easily fit in your gym bag or purse. Fold your Handy Half Sheets® in half and place them in the plastic bag. In a small bowl, mix the water, witch hazel and essential oil together. Pour the mixture into the bag and seal it, making sure there are no leaks. Gently shake the bag to soak the Tiger Towel®. Tiger Strong™ Tiger Towel® paper towel is tough enough to stand up against your mat’s gripping surface. Looking for a strong wipe that disinfects with fewer chemicals? Try this simple DIY recipe featuring Tiger Towel® paper towel. Using a sharp knife, cut the roll of Tiger Towel® paper towel in half. Remove the cardboard tube from one half of the paper towel and set aside. Pour the vinegar and water into your container. Add in the essential oil 1 drop at a time, until the smell of vinegar is almost gone. Add in few drops of dish soap and mix everything together gently. Put the half roll of Tiger Towel® without the tube into the liquid mixture in the container. Fasten the lid to the container tightly and turn the container upside down so the Tiger Towel® can absorb the liquid. Once the liquid is completely absorbed into the Tiger Towel®, your wipes are ready for use. Remember to pull wipes from the center of the roll for greater ease. 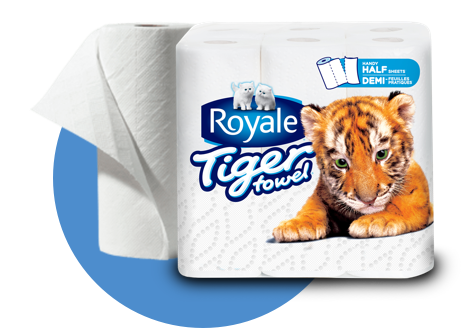 To get more tips (and a coupon to try Tiger Towel® today) subscribe to our ROYALE® emails.